OLD maps of Wisconsin, dated years after territorial times and even long after assumption of statehood, mark the south shore of the Wisconsin river as the border of civilization. Until the last two decades Northern Wisconsin was considered a trackless wilderness, broken only by an occasional clearing made by a venturesome pioneer, some lumber camps here and there, and a straggling hamlet or two at long intervals. The remarkable development of the region within this comparatively short time is one of the notable epochs in the history of the state. 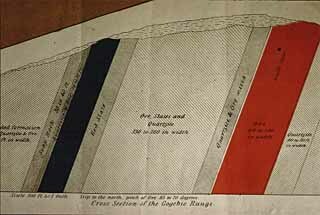 The discovery of mineral wealth gave the first impetus of considerable magnitude to this rapid growth. It led to the extension of railroads where for miles there was not a sign of human habitation; cities were built in a night, and brought enterprises that added to population and material wealth; tillers of the soil followed in fewer but ever increasing numbers; to-day Northern Wisconsin is a region of prosperous towns and thrifty farms. The story of the great Gogebic boom, one of the conspicuous episodes in the development of Northern Wisconsin, is well worth telling. The discovery of high-grade Bessemer ore on the Gogebic range and the consequent unfolding of vast possibilities led to a speculative craze the like of which has had no parallel in Wisconsin. While it lasted, fortunes were made and lost within a month--a week--it might almost be said overnight. All sorts and conditions of men and women were seized with the mania to dump their dollars into the holes dug by the prospectors, not a few of which proved bottomless pits. The country merchant and the farmer invested blindly in mining stocks, and not a few mortgaged all they had to add a lot of certificates to their holdings; in the cities, business and professional men, ministers of the Gospel, underpaid clerks and servant girls joined in the grand scramble for riches. Men who didn't possess enough money to pay a week's board in advance organized companies capitalized for a million or two, and sold stock to credulous investors. Mines were sold at fabulous prices. The enterprising sellers developed from poor men to mining kings, were rated as millionaires, and spent their money with a prodigality that seemed to warrant the title. While the boom lasted, especially in the year 1886, there seemed no limit to the extravagant hopes entertained by fortune-seekers. "It is worth more to the people than to uncover the hidden gold of Capt. Kidd or to raise the sunken treasure of the Spanish Main," were the enthusiastic words of John E. Burton at a great banquet given in Hurley. "Like a lightning flash of twining gold, for thirty miles its veins were streaked through imperishable granite, while nature, almost surprised at its lavish act, tenderly covered her treasure with a hanging wall of the gentle slates. Between the quartzite and the trap of the old Huronian belt, the unfolding of a beautiful law hid this boundless wealth more than a million years ago, to be found by some bold but favored son, whose daring deeds should be crowned and sceptered as a klng in the metallic realm." The reign of the mining king was brief--but splendid. One fortunate prospector who jumped from a meager crust of bread to affluence that seemed limitless, spent money with reckless lavishness. The buttons of his coat, vest and trousers were diamond-studded, and the gems were of the rarest size and water. In each of a dozen towns on the range he owned a handsomely furnished residence. Another miner who esteemed himself worth millions evidenced his financial plethora on one occasion by paying $35,000 for a Chicago book store, merely to acquire a dozen books which he wanted for his collection. In the mining towns splendid brick blocks and palatial houses were constructed; newspapers were issued in sumptuous editions--one issue of The Gogebic Iron Tribune included twenty pages, was printed on tinted paper in handsome style and comprised 10,000 copies. Newspaper men were carried to the range in palace cars to view the properties; so were moneyed men from The East, who had been attracted by the stories sent abroad. Gogebic stocks began to be quoted in New York and were listed regularly. Bulletins were issued daily. A stock exchange was opened in Milwaukee. The advertisement that the Gogebic range received was phenomenal. In an incredibly short time 15,000 persons had been attracted to the range. The building of Hurley and Ironwood demonstrates the rapid growth. The path that was blazed through a virgin forest from the right of way of the Lake Shore road to the Norrie mine--a distance of half a mile--less than two years later approximated the main street of a town of 4,000 inhabitants (Ironwood). The miner who opened up this property had only a short time before, in going by trail from Ashland to Bessemer, encamped overnight in an old log shack on the very site of the Norrie. For a distance of many miles and wholly beyond the limits of the vein of ore, prospectors dug pits and located mines. There was not a forty within half a mile of the range that was not honeycombed with pits ranging in depth from 10 to 150 feet. Beautifully-engraved certificates of stock in a hundred or more mining companies were issued on the basis of future finds and were eagerly purchased by people whose knowledge of mining was limited to a small vocabulary of technical terms. They could talk glibly about the "hanging wall," "running a level," "drifting the vein," "cross-cuts," and similar expressions, and they borrowed money from friends to invest in mining certificates that to-day are valuable only as souvenirs. "Get an option on every share in the Blank mine that you are able to secure at current price, and do it as quickly as you can." Before the news of the discovery of the deposit had become known, a hundred dollars had purchased an option on a thousand shares of the stook at $6.25 a share. In less than a week the two young men had sold the stock at $10.25 a share, and divided a profit of $4,000 on a week's investment of a hundred dollars in cash. This was an actual transaction, and was but one of many.